Back in May while my best friend, Laurie was visiting we went on my first dress shopping trip; however it was so last minute the only place that could fit us in was David’s Bridal! I won’t get into details, but it was a terrible experience. (Reason why I never posted any pictures.) I didn’t look at dresses for months after that. 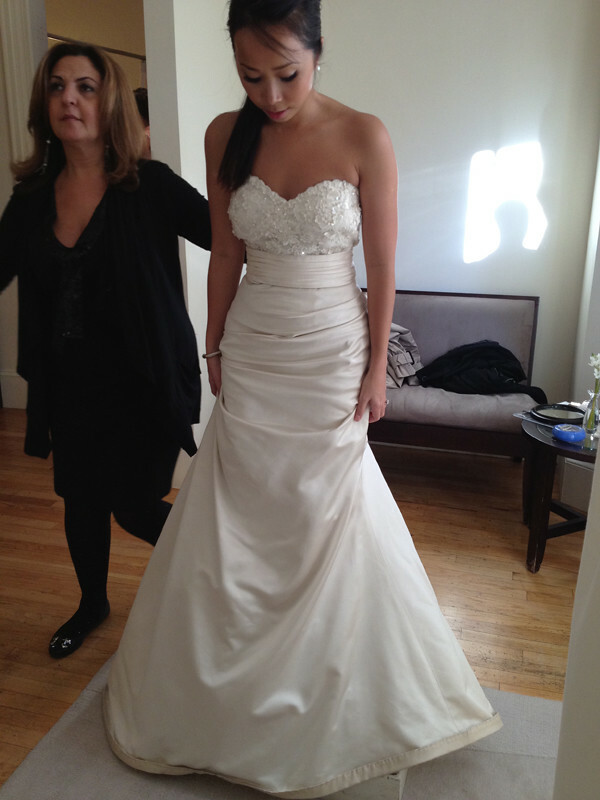 When I was ready to look again, my friend (and also MOH) Cat made appointments for Vera Wang and L’Elite here in Boston. Although I didn’t leave with “the one,” I pretty much know what I want. If you follow me on twitter, you probably saw some of these already, but here are the rest. 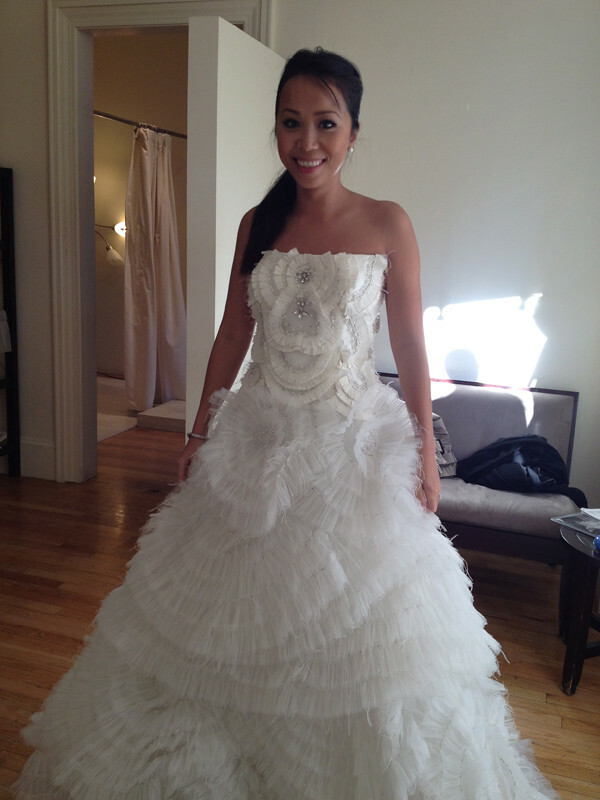 Vera Wang was amazing! I told our SA I was looking for a trumpet/mermaid dress so she didn't push me to try on anything else. Although I kinda wish she did, for curiosity's sake. Fiona. The only thing I didn't like about her was the weird asymmetric neckline. Gemma & I couldn't find her name. Gemma was a little overwhelming in person but a looker in pictures. Gretchen. This looks better on the model. Not a fan on me. Fawn. She was light, delicate and just pretty all over. Our second stop was at L'Elite. The SA here was extremely friendly and fun! Unlike the SA at Vera, she forced me to try on a variety of dresses. Both dresses are by Monique Lhuillier. The second one is the favorite amongst my friends. it is so whimsical and pretty! i love your friends' favorite on you as well! can`t wait to see what you end up wearing for your wedding day! Just gorgeous!! 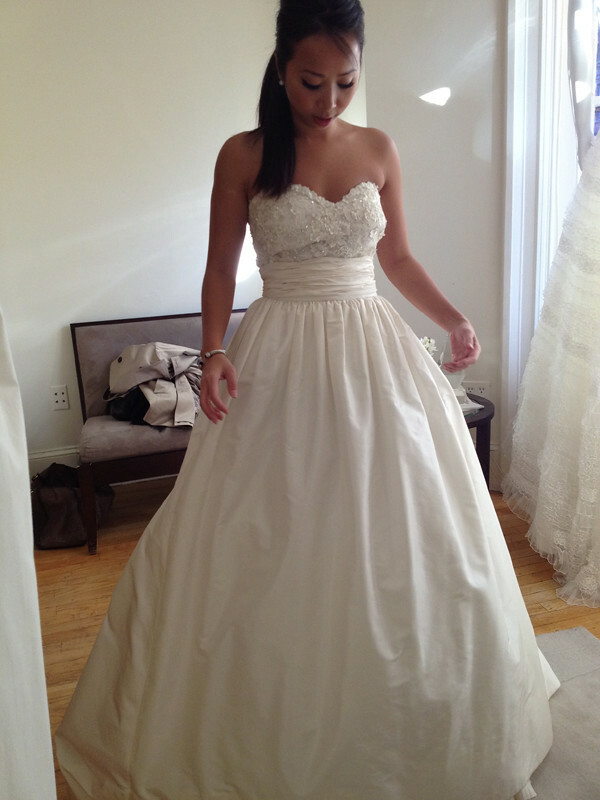 ahhh I want to go wedding dress shopping again!! I have to agree with your friends, that's my favorite on you too! Can I just say you look gorgeous in all of them!!! Girl you look beautiful in all of them! You are going to be a beautiful bride! You look stunning in ALL of these, gorgeous! I especially love the Monique Lhullier ones. WOW...you look absolutely stunning in every single one..seriously! And I love ALL of the dresses....Can't wait to see which one you choose. I don't usually comment but that second dress by Monique Lhuillier is your dress. I can't believe you didn't walk away with it! Glad that you tried on different styles, but I truly think the mermaid style looks the best! With such a slim, svelte figure, you should totally show it off. The two Monique Lhuillier dresses are my fav of the bunch! 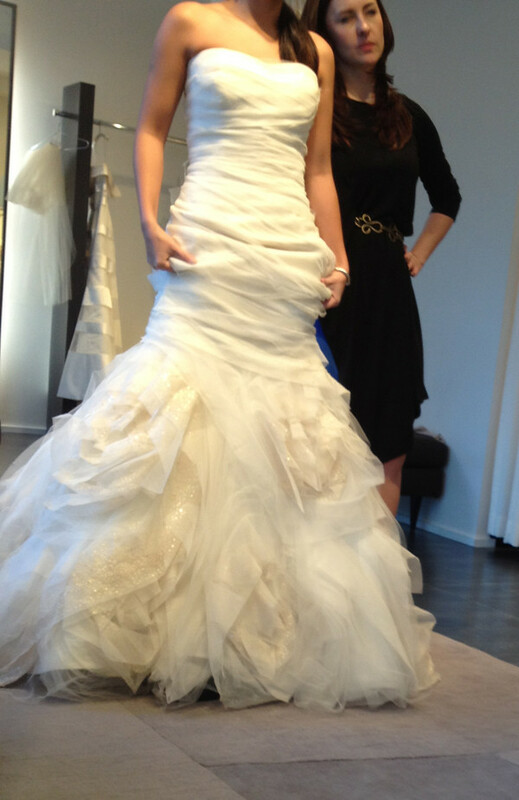 It was so fun following your wedding dress adventures on Twitter! Are you sticking to the mermaid style or did your L'Elite SA talk you into something different? They all look fantastic on you to be quite honest! However, i think the mermaid style does fit your frame the best. I hope you find the one soon! The dresses look so gorgeous on you!! I love this post! Oh my!! You look absolutely radiant Khatu! 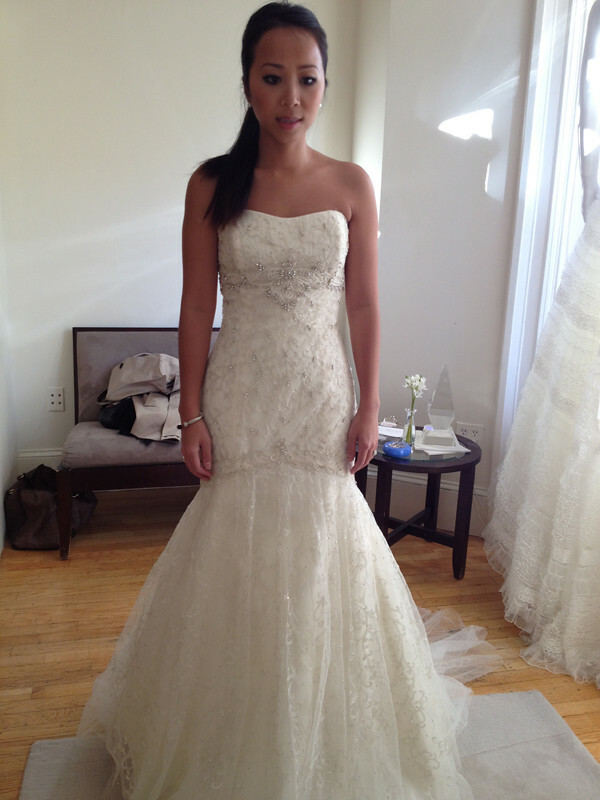 I can't wait to see what you wear on your wedding day - you're going to be drop dead gorgeous! My favourite on you by far is the OdlR skirt with the Monique Lhuillier corset (the left one). It gives you a stunning hourglass shape! You look GORGEOUS in all of those dresses. A very tough decision. Don't you wish you can have 'em all? ; ) I'm a fan of the one your friends like and also liking the first photo .. but maybe just for the pose? LOL Also really liking Ethel and Fawn. you are GORGEOUS! Whatever dress you pick will be amazing for sure. I prefer you with a more fitted type mermaid dress. These dresses are all so beautiful but I think the one for you is still out there! 2nd ML dress w/belt is also my fave so far on you. thanks for sharing. i love wedding wednesdays. The second dress my Monique Lhuillier is so nice! I love how it's so subtle! i have to agree with your friends! There is almost nothing I loved more than wedding dress shopping...love all of these looks you posted...can't wait to see what you end up with! I am loving these pictures. Ahhh! Khatu, you look so beautiful. If you're not sure, they are definitely a no! I love the ones where you are smiling so big... makes them look right, you know? :D A big smile and a wedding dress just go together. I didn't mind Davids bridal mostly because I was able to wear the dresses that were already small sized...when you go to boutiques you end up trying on sample sizes. But the quality of material was not there...I absolutely love the one your friends like too...it stands out from all of them as not too over the top yet not too plain. 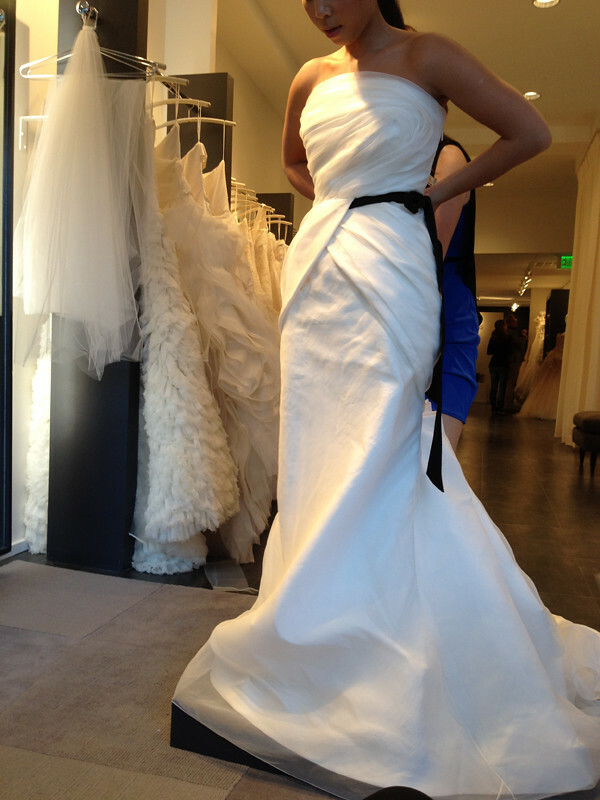 I can't wait to go wedding shopping for my own dress so I'm going to live through you for now. There is quite a few dress I like that you tried on. Have you thought of going to Kleinfield in New York? OMG all those dresses are so pretty!! The 10K Oscar ehhh I could do without that one. Ethel is my absolute favorite!!! I can't wait to see what you end up choosing. And I am so sorry to hear about your VERY bad experience at David's Bridal! All of the dresses are amazing. I'm not sure how you are going to choose!!! Great options though. Monique Lhuillier on the right is stunning on you! Wow!! You look gorgeous! You always have the best smile! These remind me of my own wedding dress, with the black detail in the middle. They are all gorgeous, go with the one that you feel most GLAMOROUS in! im loving the oscar with the flower @ the waist and the kick pleat detail in front. classy, yet not typical at all. the second Monique and the very last dress are the prettiest on you! oh man, I can't even deal with all the prettiness! Even though I don't think I'd wear one, I love the poofy dresses on you! 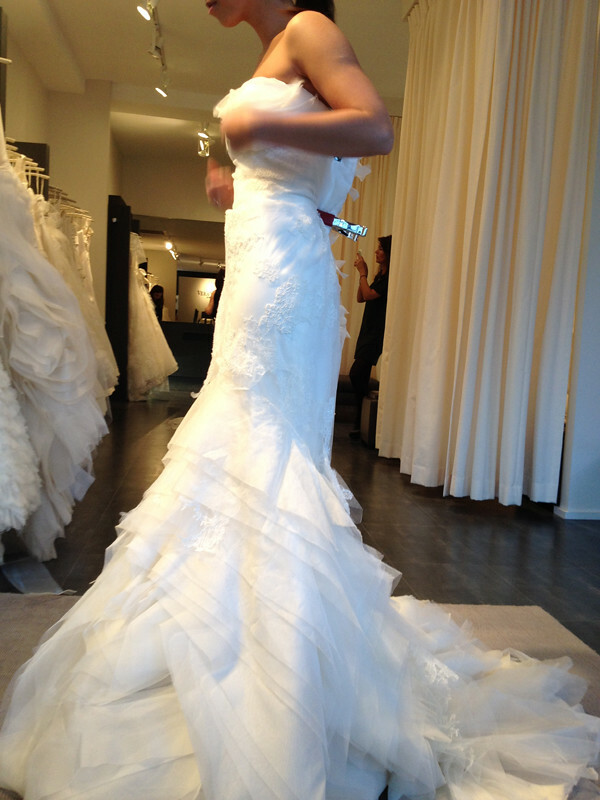 I've just discovered your blog and love it and feel compelled to tell you that it's Vera Wang's Fawn ALL THE WAY!!! 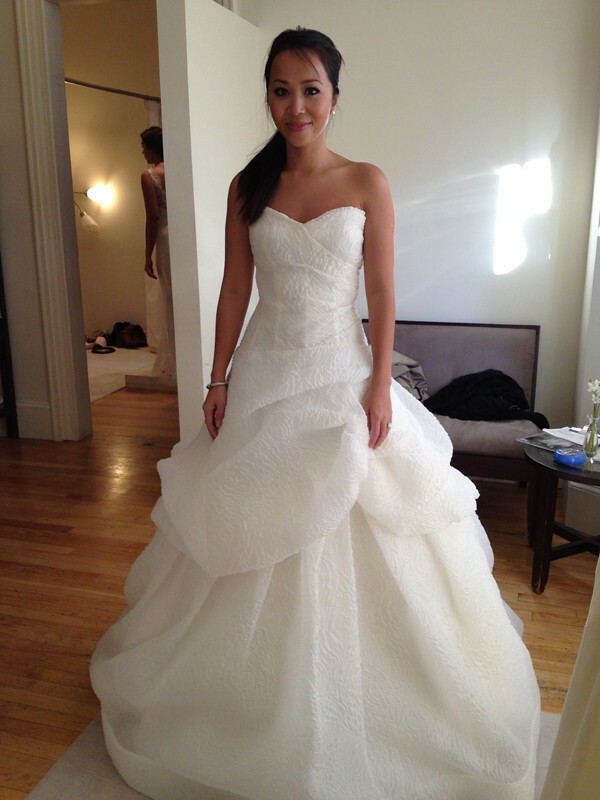 You look beautiful in all of them and it's great that you got to try on a few off the beaten path, but go for Ms. Wang! With the accompanying headpiece!! I think Fawn is probably my total favorite. It's the best one out of the bunch. And I actually dig the Asymmetrical neckline on the Fiona. It gives visual interest and makes your bust look bigger (tho not as much as sweetheart tops do). You look great in all the dresses. 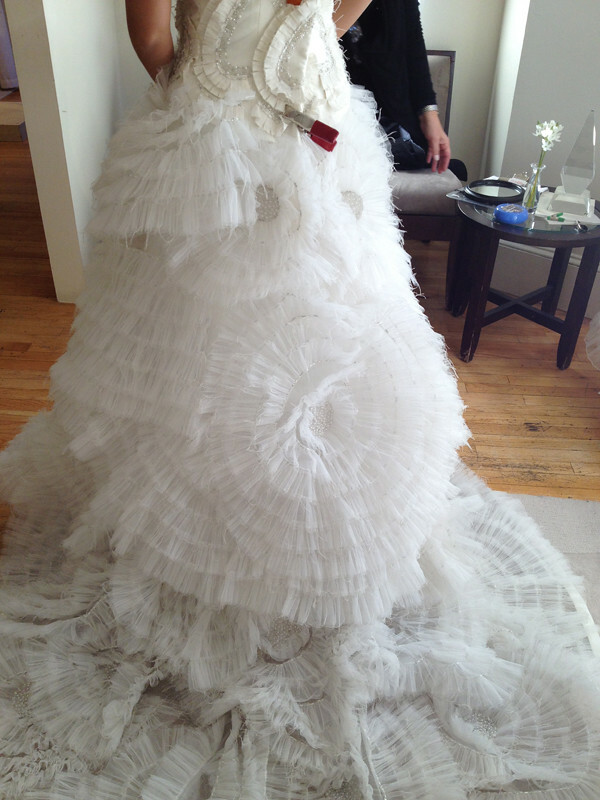 I love this wedding dress post and please keep them coming. 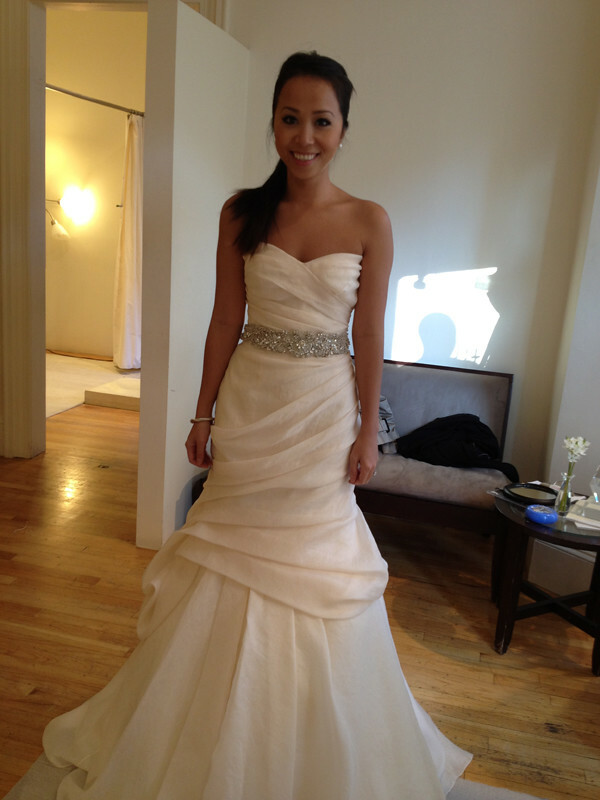 Can't believe Vera Wang has a dress with the same name as me! My favorites are the Ethel and the second Monique Lhuillier. I like that you tried everything on (my first choice was a trumpet, went with an a-line/ballgown- it actually looked a lot like the first Monique L., just more embellished) but mermaid/trumpet looks so stunning on you! I can't imagine you in anything else! Gosh you look absolutely stunning in all of them!!! When will my turn come?! I like the last one to the left. all the dresses look amazing on you!!! to die for! I love the last one it looks really great on you!!!! I just found your blog and am so happy to see a Wedding Wednesday post. I'm newly engaged (just short of a month) and have also just started a type of Wedding Wednesday on my blog to keep myself on track and share the details with my readers. I'm excited to see your wedding plans and maybe gain some inspiration :) All of these dresses are gorgeous and you look gorgeous in them! I'll be linking my brother's fiance to this page! The dresses are so pretty and you look gorgeous in all of them! how fun! the monique ones are gorgeous on you... def my faves! I am a big fan of Vera Wang Wedding Dresses collections. 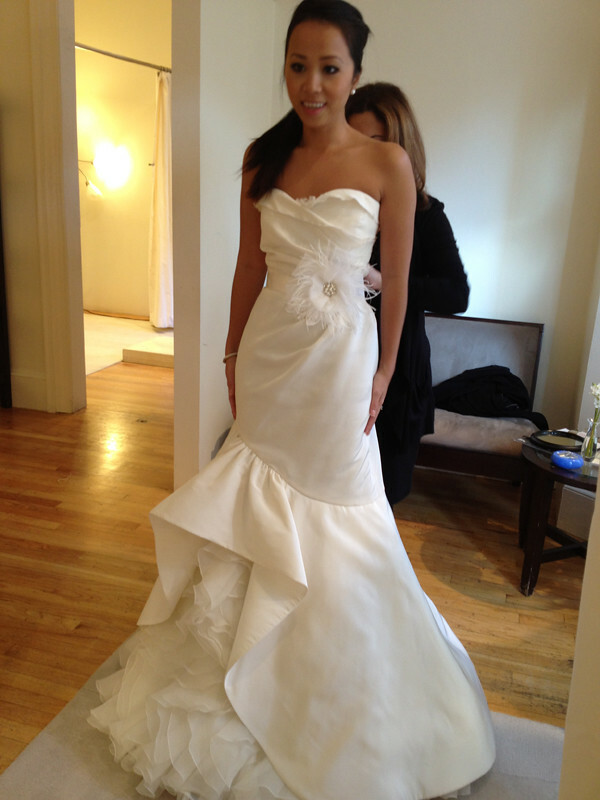 I would love to be dressed in most modern stylish wedding gown collection of Vera Wang on my wedding.